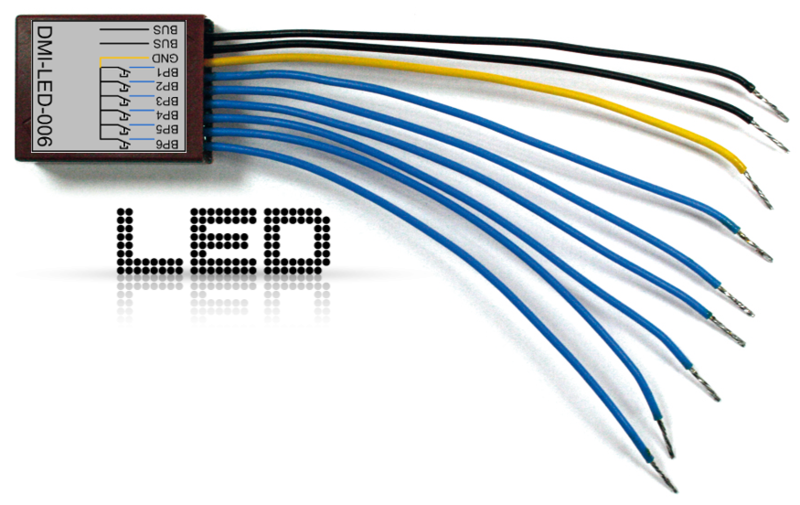 The “DMI-LED-006” module is an identification module with LED intended to be housed in a switch box. A module for connecting 6 push buttons associated with any command. The response from the module is in real time so there is no loss of address. - Any brand of push button switch providing a potential-free contact. - Movement sensor providing a delayed potential-free contact (cessation of the detection for a certain period). - Alarm providing a potential-free contact during an intrusion. This can light up the whole house for example. - Any other input providing a potential-free contact. Maximum voltage of LEDs : DC 12V. 2 black wires : non-polarized bus. 6 blue wires : dry-contact inputs. 1 yellow wire : common to dry contact inputs. 1 red wire : LED positive supply. 1 black wire : LED negative supply. 1 purple wire : RS485 A bus. 1 green wire : RS485 B bus. 1 red wire : LED positive supply (common anodes). 6 white wires : 6 LED returns (LED cathodes).